The Coral Snake, made by Henrys of Germany, was their more expensive--and heavier--aluminum-hubbed version of the plastic-hubbed Tiger Snake. This model had the Speed Explosion ball bearing axle pre-installed. The Speed Explosion axle was part of Henrys AXYS system--a modular system of four different axles that were completely interchangable with Henrys' entire yo-yo product line at the time. As with all Henrys yo-yos, the string gap was completely adjustable by slightly rotating the halves. Henrys called their string gap adjustment capability Quicktrick. 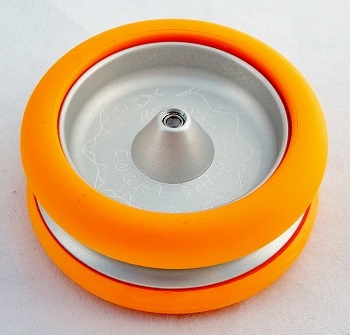 The original release of Henrys Cobra Snake had a very weak reverse starburst response added to the aluminum hubs. Original retail price: $50 US.